We’re a big fan of zoos and aquariums but wouldn’t it be great to experience animals in a more up close and personal way? We’ve rounded up some of the best animal adventures here at home and across the globe. How about a nice dinner with a polar bear? A conversation with a kangaroo? Ever feed a lemur before? Now’s your chance. And, you can bet that no two encounters will be exactly the same. Keep reading to see them all. While most families go to Orlando for the theme parks, we encourage you to take a little detour and visit the Safari Wilderness Ranch which is about 45 minutes away from the big city. There are no crowds or lines here, which can be a nice change from your usual hustle and bustle trip. Within the 260 acres, you’ll find hundreds of animals including zebras, goats, ostriches, llama, camels, lemurs, red lechwes, elands and more while being driven around by an experienced guide. The safari vehicles are fitted with shade canopies and stadium seating for extra comfort and better viewing. Or, you can view the animals by camelback. Costa Rica is home to five of the seven species of sea turtle, and since they lay their eggs on the Pacific and Caribbean shores every month, it is possible to spot the creatures on the shoreline all year round. One of the best places to take a “turtle tour” is the Las Baulas National Park during the nesting season which runs roughly from mid-Oct. to mid-Feb. Tours to see nesting leatherback turtles are always at night and restricted to just 30 people per tour so you’ll be able to get a good look at them! You can register up to eight days before your tour date to make a reservation. Set sail on a schooner for a whale watching voyage off the coast of Massachusets (yellow slicker not required, but perfect for holiday card photos). In addition to the rich whaling history of the area, the Stellwagen Bank Marine Sanctuary—a rich feeding ground for whales, dolphins, sea birds and other marine creatures—practically guarantees you'll catch sight of humpbacks, finbacks, minkes, pilot whales or the critically endangered right whales. While cruising with Boston Whale Watch Tours, you’ll learn about whales from New England Aquarium naturalists who are always on board to share what they know about these magnificent mammals. Located outside the big city of Tacoma you’ll find Northwest Trek which is home to over 40 species of native Northwest animals including bison, bears, moose, elk, bighorn sheep, caribou, beavers, otters and more all living in their natural habitats. Admission includes the 40-minute Discovery Tram Tour which covers the 435 acres of the free-roaming area. Other attractions include Animal Walking Tours (where your family can view the animals from a safe distance), Keeper Chats (where you can learn more in-depth animal behavior stuff), the Cheney Family Discovery Center (a hands-on animal museum), the E.H. Baker Cabin (where you can get up close to a gray wolf) and the Trek Fairy Trail (where tiny houses are on display). Adventure seekers may want to spring for the Keeper Adventure Tour (a 90-minute off-road jeep tour) or the Zip Wild Deep Forest Challenge (five zip lines between various obstacles). Truly unique, Discovery Place Nature is half zoo, half museum. There are plenty of live animals to visit, daily shows to watch, hands-on demonstrations to partake in and creative play areas to burn off extra energy. 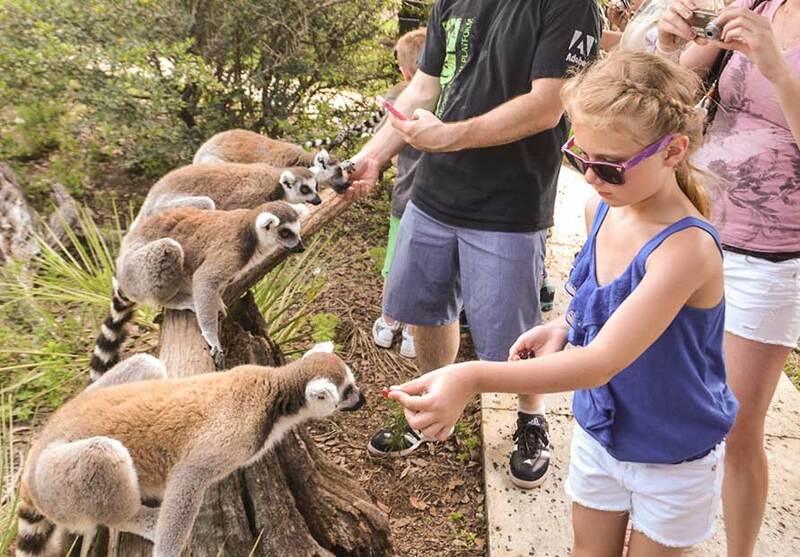 Some of the highlights here include visiting Louis, a juvenile American alligator during feeding time, take a walk through the Butterfly Pavilion, exploring Insect Alley, or getting up close and personal with a number of wild animals while also learning about their native diets, habits and habitats with a museum naturalist. How would you like to go on a walk with a polar bear or sit down for a nice dinner with them? You can! Churchill Wild offers the only remote fly-in ecolodges on the planet located on the Hudson Bay coast, deep in the heart of the polar bear country. While there, you can take in a polar bear walking tour, a photo safari and if the weather is right, viewing the northern lights. Unlike other nature tours, this company boasts that in its 25-year history, every tour group has seen bears. Just don’t expect to get a hug. Good to know: The minimum age for children on tours is eight-years-old. As if a trip to Hawaii wasn’t enough, this resort steps it up a notch for animal lovers. Located on the North Shore of Oahu, Turtle Bay Resort offers a variety of animal adventures throughout its 800 acres of property. Here you can kayak among sea turtles in glass-bottomed kayaks and then stop by the “sea turtle cleaning station” on your way back! Other adventures include HorSea Yoga which is a combo of horseback riding and yoga, “hang ten” with a surfing dog, climb in a shark cage (we’ll skip this one, but you go right ahead), view the monk seals on the shoreline or take a dolphin tour. The Marine Mammal Center is one of the largest marine mammal facilities in the world to combine animal rehabilitation and research lab, and the only one authorized by the National Marine Fisheries Service to rescue and treat marine mammals along the Central and Northern California coast. It can care for up to 200 seals, sea lions and other marine mammals at once, and since the center annually treats, on average, 800 or more mammals, any time of year is a good time to visit. The Marine Mammal Center is open to the public and offers docent-led tours that are ideal for individuals and families (nine people or fewer) that want to learn more about the work of the Center. You don’t have to go “down under” to get up close to a kangaroo. Located about an hour north of Seattle, the Outback Kangaroo Farm offers 40-minute wildlife tours featuring not only kangaroos but also wallabies, tortoises, wallaroos, lemurs, llamas, alpacas, peacocks, Nigerian dwarf goats, mini donkeys, parrots and emus. Unlike your local zoo, you’ll be able to interact with many of the animals while asking the experts everything you ever wanted to know about these creatures. Teton Raptor Center began in 1991 when two field biologists began caring for injured raptors out of their home. Now they care for over 130 injured birds per year! In addition to onsite programs (which are actually limited this year due to renovations), the center offers some special events. Feathered Float with Friends is described as a tranquil mid-day float on a vintage wooden boat down the Snake River to discover raptors and other wildlife. The tour includes an hour-long, up-close learning experience at the center. Flights and Feathers is a meet-and-greet with birds at the Jackson Hole Airport offered on various Saturdays throughout the year. In the picturesque waters of Crystal River in Florida's nature coast, families can enjoy the sunshine and company of manatees—gentle giants that make the river's headwaters their home because of a constant 72-degree temperature. In the winter more manatees migrate to the river, but some stick around as year-round residents. Crystal River is one of the only rivers in Florida where people can legally interact and swim with the manatees in their natural habitat. Multiple touring outfitters provide river cruises and snorkeling/swimming options for visitors (ages three and up). Not sure you want to get in the water with these lovable sea cows? They surface regularly for air, so a river cruise or a viewing from the Three Sisters Springs will still afford an exciting encounter. Two herds of wild horses make their home on Assateague Island, separated by a fence at the Maryland-Virginia line. Small but sturdy, these shaggy horses eat dune and marsh grasses and drink fresh water from ponds, and are the descendants of the survivors of a Spanish galleon which wrecked off the coast of Assateague in 1750. That's one story. The other is that they're offspring from the horses of early settlers. Either way, they're wild now, and amazing to watch as they roam free on the island. The best way to view Chincoteague Ponies is from a charter boat tour, offering pontoon or kayak access to the north end of Assateague and the more highly populated end of the island. Noah’s Ark is a nonprofit that provides care and treatment for over 1,500 animals, including exotic, wildlife and domestic animals that arrive from the Department of Natural Resources, zoos, educational institutions and from the general public. By creating habitats that mimic the animal's natural environment, Noah’s Ark promotes humane, responsible animal treatment and ownership. Located just 40 minutes from Atlanta, this Georgia animal sanctuary offers self-guided tours, private tours and keeper for the day experiences.